A new high-performance anode structure based on silicon-carbon nanocomposite materials could significantly improve the performance of lithium-ion batteries used in a wide range of applications from hybrid vehicles to portable electronics. Produced with a "bottom-up" self-assembly technique, the new structure takes advantage of nanotechnology to fine-tune its materials properties, addressing the shortcomings of earlier silicon-based battery anodes. The simple, low-cost fabrication technique was designed to be easily scaled up and compatible with existing battery manufacturing. 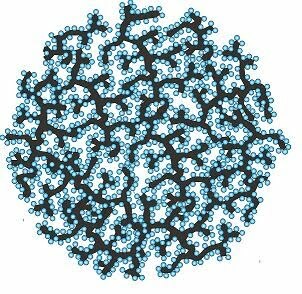 Details of the new self-assembly approach were published online in the journal Nature Materials on March 14. "Development of a novel approach to producing hierarchical anode or cathode particles with controlled properties opens the door to many new directions for lithium-ion battery technology," said Gleb Yushin, an assistant professor in the School of Materials Science and Engineering at the Georgia Institute of Technology. "This is a significant step toward commercial production of silicon-based anode materials for lithium-ion batteries." The popular and lightweight batteries work by transferring lithium ions between two electrodes -- a cathode and an anode -- through a liquid electrolyte. The more efficiently the lithium ions can enter the two electrodes during charge and discharge cycles, the larger the battery's capacity will be. Existing lithium-ion batteries rely on anodes made from graphite, a form of carbon. Silicon-based anodes theoretically offer as much as a ten-fold capacity improvement over graphite, but silicon-based anodes have so far not been stable enough for practical use. Graphite anodes use particles ranging in size from 15 to 20 microns. If silicon particles of that size are simply substituted for the graphite, expansion and contraction as the lithium ions enter and leave the silicon creates cracks that quickly cause the anode to fail. The new nanocomposite material solves that degradation problem, potentially allowing battery designers to tap the capacity advantages of silicon. That could facilitate higher power output from a given battery size -- or allow a smaller battery to produce a required amount of power. "At the nanoscale, we can tune materials properties with much better precision than we can at traditional size scales," said Yushin. "This is an example of where having nanoscale fabrication techniques leads to better materials." Electrical measurements of the new composite anodes in small coin cells showed they had a capacity more than five times greater than the theoretical capacity of graphite. 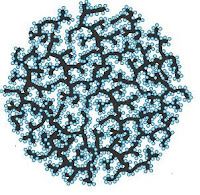 Fabrication of the composite anode begins with formation of highly conductive branching structures -- similar to the branches of a tree -- made from carbon black nanoparticles annealed in a high-temperature tube furnace. Silicon nanospheres with diameters of less than 30 nanometers are then formed within the carbon structures using a chemical vapor deposition process. The silicon-carbon composite structures resemble "apples hanging on a tree." Using graphitic carbon as an electrically-conductive binder, the silicon-carbon composites are then self-assembled into rigid spheres that have open, interconnected internal pore channels. The spheres, formed in sizes ranging from 10 to 30 microns, are used to form battery anodes. The relatively large composite powder size -- a thousand times larger than individual silicon nanoparticles -- allows easy powder processing for anode fabrication. The internal channels in the silicon-carbon spheres serve two purposes. They admit liquid electrolyte to allow rapid entry of lithium ions for quick battery charging, and they provide space to accommodate expansion and contraction of the silicon without cracking the anode. The internal channels and nanometer-scale particles also provide short lithium diffusion paths into the anode, boosting battery power characteristics. The size of the silicon particles is controlled by the duration of the chemical vapor deposition process and the pressure applied to the deposition system. The size of the carbon nanostructure branches and the size of the silicon spheres determine the pore size in the composite. Production of the silicon-carbon composites could be scaled up as a continuous process amenable to ultra high-volume powder manufacturing, Yushin said. Because the final composite spheres are relatively large when they are fabricated into anodes, the self-assembly technique avoids the potential health risks of handling nanoscale powders, he added. Once fabricated, the nanocomposite anodes would be used in batteries just like conventional graphite structures. That would allow battery manufacturers to adopt the new anode material without making dramatic changes in production processes. So far, the researchers have tested the new anode through more than a hundred charge-discharge cycles. Yushin believes the material would remain stable for thousands of cycles because no degradation mechanisms have become apparent. "If this technology can offer a lower cost on a capacity basis, or lighter weight compared to current techniques, this will help advance the market for lithium batteries," he said. "If we are able to produce less expensive batteries that last for a long time, this could also facilitate the adoption of many 'green' technologies, such as electric vehicles or solar cells."